10 BEST Energy Ball Recipes! Last night I needed something to satisfy my sweet tooth; something naturally sweet, dairy free, and easy. I decided to do up some Chocolate Peanut Butter Energy Balls, and it got me thinking about just how creative you could get with these little beauties. So naturally, I had to see what else was out there. As a result, I have done you a huge favor today: I scoured the Internet for the 10 BEST energy ball recipes and assembled them all in one easy place… right here. Four ingredients, really? That is ridiculous….ly awesome. The creator promises that these are packed with “SO MUCH DELICIOUS PROTEIN GOODNESS that your muscles are going to EXPLODE out of your body just by reading it” …. Girl I think I feel something! This gal gets it. I am tired of waiting all year long for my pumpkin fix! We’ve been deprived long enough. I want to eat these beauties on a porch with my morning coffee. These energy balls look so soft and smooth, like they could just melt away in your mouth. Matcha is a powerful antioxidant, and it also helps with energy and focus, so when Heartfelt Kitchen calls these “energy balls”, she means it! I can’t get over the gorgeous pink hue of these energy balls! These would be absolute perfection for a baby shower, birthday, or bachelorette party. Or a Saturday night alone. I’m making these on Saturday and eating them all. I love coffee, therefore, I love coffee flavoured anything. These Mocha Energy Bites sound just divine, AND they have the added benefit of Maca as well! Thank you so much to the creator who included the health benefits of maca on her page. The presentation of these energy balls gives me stars in my eyes – they are just beautiful! I also love that these contain molasses – not only do I love the taste but blackstrap molasses in particular can be nutritionally dense if you so choose to use it! The first thing I thought when I saw these tasty, cakey, glowing balls of yummines: “How did she get these so yellow?” – I won’t spoil the surprise but lets just say it made me love these even more. I love it when I come across a recipe and I think “I never would have thought of that!”. These energy balls sound inviting and the fig adds a hint of excitement. I don’t know about you, but most of these ingredients are already in my pantry, so these would be convenient to make! 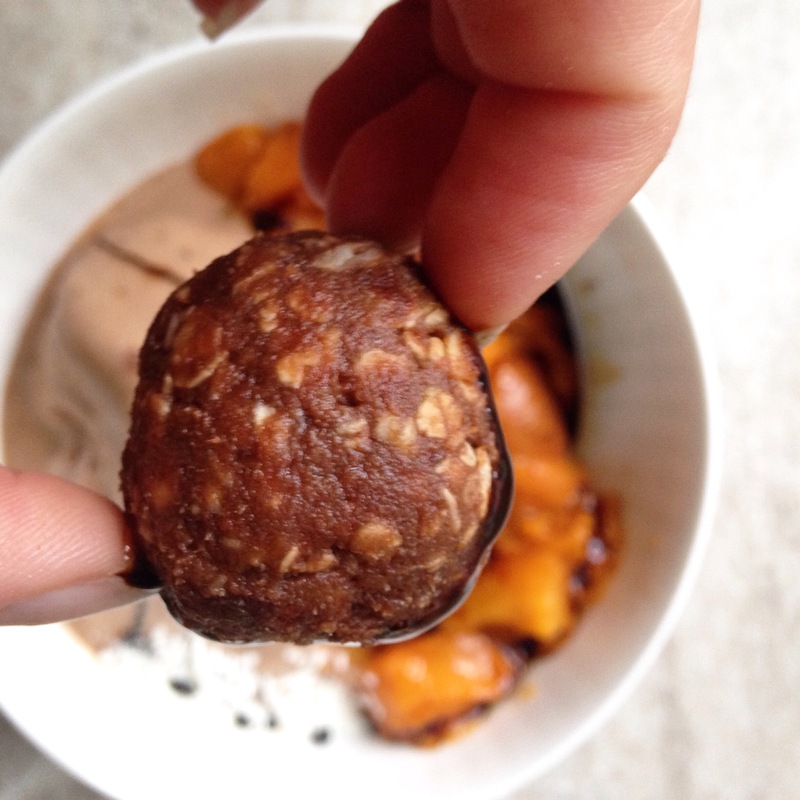 Talk about wow – these are unlike any other energy balls I’ve ever seen! But apricot and ginger are just such a tasty duo, and I love the contrasting colours between the inside and the black sesame seed coating. Who doesn’t love banana bread? Seriously who. Find me one person. See? It’s impossible. I actually eat at least two bananas every day, I love bananas so much! It looks way more fun to eat in this sweet, spherical version though. Thank you for joining me on this bite-sized adventure! Now for the big question: which one of these would you make? They all sound good but the chocolate peanut butter and gingerbread! YES!